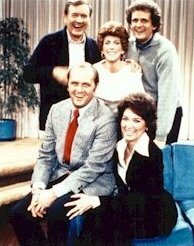 The Hallmark Channel has acquired the cable rights to the classic '70s sitcom The Bob Newhart Show! The classic comedy will begin next week on Monday, Jan. 2, 2012 and will air every weekday morning in a block from 8-10am with four episodes every morning. The cable network has been airing Christmas movies since Thanksgiving so the sitcoms have taken a back seat since, but they will return on Jan. 2. Essentially the block will replace The Golden Girls from 8-10am. This is the first schedule change in quite some time for Hallmark, so we will recap to you their line-up. Mornings begin with I Love Lucy from 5am-8am leading into Bob Newhart from 8am-10am. Mr. Newhart and company will lead into the Martha Stewart at Home block from 10am-3pm. Then afternoons and evenings will remain the same with back-to-back-to-back hours each of The Waltons from 3-6pm and Little House on the Prairie from 6pm-9pm. In primetime, Frasier also remains from 9pm-12am, followed by The Golden Girls from 12am-2am. Cheers gets an hour late nights from 2-3am, leading into more Frasier from 3am-5am. On weekends, we have I Love Lucy still from 5-8am leading into The Golden Girls from 8-10am. Movies take over from 10am-12am and then more The Golden Girls airs from 12am-2am, followed by a block of Frasier from 2am-4am and finally an hour of Cheers from 4-5am. Marathon wise, you can catch a marathon of The Golden Girls on Martin Luther King Jr.'s Birthday on Monday, January 16, 2012 from 3pm-2am. As for The Bob Newhart Show, it currently also airs on digital broadcast TV on MeTV Network. It also airs on cable on FamilyNet since this past fall every evening and in primetime, so Hallmark will share the rights with FamilyNet. So now if you don't get MeTV or FamilyNet, you'll be able to watch Bob on The Hallmark Channel, as mostly everyone with cable has this network. Stay with us for further information. If you missed the first cycle of the short-lived Three's Company continuation series Three's a Crowd starring John Ritter on Antenna TV this past summer now you have another chance to watch all 22 episodes! Just like how Antenna TV aired a second cycle of The Ropers, they will air Three's a Crowd again in the Three's Company time period of Mon-Thurs from 8-9pm (with an encore from 12-1am) starting Thursday, Dec. 29, 2011. This will be only for 11 nights, since it only had 22 episodes and they air two episodes a night. Three's Company is tentatively scheduled to return with its first episode on Wednesday, Jan. 18, 2012. That will be the start of the long-running series' third cycle on Antenna TV. You can catch the series finale on Wednesday, Dec. 28 before Three's a Crowd takes over for the next eleven nights. I just love how they incorporate both The Ropers and Three's a Crowd into the Three's Company cycle. You'll see The Ropers series again on Antenna TV for the third time when those characters leave Three's Company at the end of season three. If my calculations are correct, it will be sometime in early March. So you'll see The Ropers in the second half-hour of the Three's Company hour and air for 28 nights, as they will only air one episode a night and the series had 28 episodes. Stay with us for further information as always!